Using the Datamaran Research Tool, I looked for how many companies are talking about safeguarding in their sustainability reports. It seems, that safeguarding can be applied to just about everything. L'Occitane International SA goes for another type of safeguarding -safeguarding the future of bees while helping to build communities. In fact, safeguarding has become so popular that I am thinking of safeguarding my personal ice cream supply for the next five years. As you can see, safeguarding can apply to just about anything and the use of the term safeguarding is bandied around quite freely in CSR and sustainability worlds with no real accountability for what safeguarding anything actually means and how to measure it. Maybe this is a shame, because there is one use of the term safeguarding that is arguably the most important use of all: safeguarding vulnerable children, youth and adults. I happen to know a bit about this, as my niece, Sarah Carlick, (Yay! Proud Auntie) is a leading expert on safeguarding in the UK, and runs The Athena Programme, one of the best known and most active consulting and training firms dedicated solely to safeguarding in the important sense of the word. Sarah has just completed her doctoral thesis on safeguarding, so we shall be calling her Dr. Sarah in the very near future! (Yay! Extremely Proud Auntie). Read Sarah's insights into safeguarding in a corporate context later in this post. Some companies stand out in their approach to safeguarding vulnerable children and adults. Pearson's Sustainability Report for 2016 includes a commitment to safeguarding adults and children. As a company engaged in education and supporting learners all over the world in schools, training and learning centers and other teaching facilities, and even virtual classrooms, human rights risks and challenges are very real for Pearson and it seems quite obvious that safeguarding would be directly relevant to this company's business. Another company that has a safeguarding focus, and also rather obviously so, is LEGO. With a business designed to engage children, LEGO partners with UNICEF to implement and globally promote the Children’s Rights and Business Principles developed by UNICEF, the UN Global Compact and Save the Children, and to promote the importance of play for early childhood development. LEGO's 2016 Corporate Responsibility Report also discloses what LEGO is doing to safeguard children. LEGO's Digital Child Safety Policy was developed as an industry leading practice to ensure the welfare of children interacting with digital channels. The policy is implemented through mandatory training for employees who work directly or indirectly with children online and also applies to partners who deliver LEGO® branded experiences. Online safety is relevant not only for companies in the education and toy development sectors. It comes up regularly as a key material topic for companies that provide internet or media content. For example, Liberty Global (whose reporting I have supported for the past several years) has invested millions in protection of children while online and watching TV (one of the company's most material impacts) through collaboration on the development of an entire set of resources for children at different stages of development and exposure, parents, teachers and schools. In 2015, Liberty Global joined the ICT Coalition for Children Online, which aims to help young people in Europe make the most of their digital life and be better equipped to handle the challenges and risks it may bring. There are more positive examples of safeguarding out there, enough to convince you that safeguarding is an essential element of corporate responsibility. (For those who want a fascinating and sobering read on this subject, see also Joel Bakan's Childhood Under Siege: How Big Business Targets Children). Many companies, especially food companies, have responsible marketing policies where the aim is not to market directly to children under age 12 - though in practice, exposure of children to marketing in all its forms today is impossible to monitor, I believe. Most companies today explicitly prohibit child labor in their supply chains. That's an obvious one in modern times, I guess, even though there is still much work to do to achieve safe supply chains. But there are endless, not so obvious other ways that children are exposed to and are potentially at risk from the practices of corporations. This may be unintentional but it should not be unknown. Corporations have a duty of care to understand the impacts of their activities on children. I believe, however, that this topic in the broader sense of safeguarding vulnerable children and adults has flown largely under the radar and is not explicitly included in sustainability frameworks and standards such as GRI or SASB, beyond responsible marketing and avoidance of child labor. I think this could be a new area for a potential performance and reporting standard. I want you to hear from the expert herself, Sarah Carlick, Founder and Managing Director of The Athena Programme. Why did you choose safeguarding as your area of specialist expertise? "Safeguarding was my background as a social worker and probation officer which I was drawn to because of my passion for helping and protecting vulnerable people. Through my work and experience of safeguarding at both a national and international level, I am now able to incorporate all areas of this important and complex topic under one umbrella which I think is the most effective way of achieving results to benefit those that are vulnerable or at risk of harm." In a business context, what are the connections to safeguarding? What are the key safeguarding risks for companies? "Governance, compliance, reputation, recruitment, social media communications, customer relations and interactions are all areas where safeguarding is a relevant potential risk that must be proactively managed. For companies or organizations that have services that are used or may be used by children, families or vulnerable adults, there may well be legal compliance issues (in different countries) as well a range of potential risk areas that are not currently legislated. While businesses often look outside for the impacts of safeguarding (for example, with services used by children), there is also an internal aspect. How do companies support their own employees who may be victims of domestic abuse, for example? I think there are many connections between the practices of business and corporate responsibility to protect vulnerable children and adults, and some may not be so obvious." Does every company need a safeguarding policy? Can you give some examples of where such a policy might be needed? "Not every company needs a policy, but some are required to have a policy and set of procedures, for example, those that are regulated or inspected, those that apply for external funding, or those that have residential services, schools, a charitable arm, or where they employ apprentices, teachers, mentors, nurses, dentists or manage learning environments, to mention just a few cases." In what context is it important to train company employees in safeguarding? "It is important as safeguarding is two-fold - both protecting and supporting your staff and as well as protecting and supporting those that use your services. There are many areas that come under safeguarding, for example, modern slavery, child sexual exploitation, on-line grooming and emerging risks such as prevention from radicalization." What can you and The Athena Programme do to help companies practice effective safeguarding? "Whatever your needs, Athena can help any company with everything to do with safeguarding children and/or adults at risk. If it’s about safeguarding – we’re the experts. A first step we can help with for many companies will be to map the nature, scale and impact of their activities and identify the safeguarding hotspots - immediate and/or significant risks that need to be managed. From there, we can help companies develop tailored policies and procedures, formulate communications packages, deliver training for all staff and put in place monitoring and reporting tools. For companies who are not sure, we can or simply come and speak to your management, or deliver a lecture on what to watch for. We are always happy to listen to the challenges companies face, or help them decide what the challenges are and minimize potential risks. We have strong credentials from our work over the past 10 years, so we are confident that we can help companies do better in this area." If you are interested in exploring more, contact Sarah here. Either way, I think we are going to hear a lot more about safeguarding, and not just safeguarding anything, but safeguarding those who matter most, our children and our youth and our friends and families and communities who may not be able to protect themselves. If that's not CSR, what is? Last month, I was honored to be invited to join the next stage in the transparency journey of a wonderful, privately-owned group of companies in Sweden. The parent company is Lindéngruppen, and it describes itself as "a second-generation family business focusing on sustainable long-term development of industrial companies". In 2016, Lindéngruppen’s wholly-owned companies had a combined turnover of approximately SEK 7.4 billion, and more than 3,200 employees in 27 countries. Lindéngruppen, based in Höganäs, Sweden was founded by Ulf G. Lindén in the mid-eighties and is now led by the Chairperson of the Board, his daughter, Jenny Lindén Urnes. Beckers is a global industrial coatings company specializing in coil coatings and industrial coatings for metal. Beckers also provides finishes for consumer electronics and lifestyle appliances. Colart supplies the world’s most popular art material brands. Colart’s mission is to provide sustainable, creative tools and services to release pure expression. Höganäs is the world’s leading producer of metal powder and the main driver of the development of metal powder applications. Moorbrook Textiles produces woven-textile products from luxury fibers. These four businesses are primarily B2B, and do not have all that much in common in terms of the nature of their business, beyond their ownership and shared values as members of the Lindéngruppen family. But that is clearly enough to sustain responsible practice, as all four companies are guided by the enlightened, passionate and visionary leadership of the group's Chair, Jenny Lindén Urnes, whom I was privileged to meet at the first Lindéngruppen Sustainability Reporting Conference for the companies in the group last month. Her commitment to growing positive-impact businesses shines clearly as an inspiration for all. At the one-day event, where company CEOs, sustainability, EHS and HR professionals came together as a group of more than 30 people, I shared my thoughts and insights about Sustainability Reporting, with a focus on the benefits for privately owned and smaller sized enterprises, and engaged in discussion with the business leaders. During the day, teams works on future scenarios and considered the challenges and opportunities that sustainable practice might bring. And all of this took place at Färgfabriken in Stockholm, Beckers' old paint factory built in 1889 and later converted into a cultural institution, supported by Lindéngruppen, now serving as a platform for contemporary cultural expressions, with an emphasis on art, architecture and urban planning, using approaches that help explore and understand the complexities of our constantly changing world. What a superbly fitting venue for a day of free thinking and collaboration. The Lindéngruppen companies started their sustainability journeys well before this first shared experience, however. Each company has been applying sustainability principles and transparent practice in its own way with its own particular relevance and focus. Beckers has been publicly reporting on sustainability since 2012 and its most recent Sustainability Report for 2016 is GRI compliant report with a focus on 8 core material topics underpinned by a sustainability vision. In this report, Beckers shares the progress made in the development of Beckers Sustainability Index, a tool to help customers understand and make more informed choices based on data about the sustainability profiles of Beckers coating products. Last year, Beckers converted the index into an IOS/android app allowing customers to easily contrast the sustainability performance of different coating systems. This is an example of Beckers integrating sustainability in its core business through the products it sells, beyond managing the direct impacts of its production and other activities. It's about the impact of the business on society, not just about operating responsibly. Colart's Sustainability Report for 2016-2017 reflects the color and creativity that are the essence of this company. Aligning with the UN SDGs, Colart identifies 12 goals that are most relevant for its business impacts and contribution to society. Using a seven-step "GET WISER" approach to sustainability strategy, Colart has been embedding awareness and understanding across all levels of the business, and engaging in creative platforms to promote the use of art for positive impact, such as “Hospital Rooms”, a UK-based mental health charity that commissions artists to create inventive environments and artworks for mental health units and holds art workshops for mental health service users. Aligning positive social impact with core business expertise helps make this partnership a success. Höganäs has just started its reporting journey with an initial internal report for 2016 that has not been published as the company prepares for external reporting for 2017. Nonetheless, having had the benefit of a sneak preview, I can say that the 2016 Höganäs internal report is a strong GRI-based report, reinforcing the sustainable contribution of metal powders that help reduce resource consumption and make manufacturing processes more efficient. There is much scope here, as metal powders from Höganäs are used in component manufacture, electrical applications and filters, surface coating, welding and brazing, water purification, cleaning of industrial wastewater, soil remediation and more. With more than 700 patents on metal powder processes and products, Höganäs invests in building its expertise and creating sustainable solutions for customers. With five central thrusts in its sustainability strategy to climb "Mount Sustainability", Höganäs is advancing climate neutral operations and sustainable offerings for customers while managing direct workplace impacts and engaging in communities. Höganäs is a partner in developing and advancing Swedish Sustainable Steel Vision for 2050 with other sector players in Sweden, playing a role in shaping a more sustainable future for the industry. Moorbrook Textiles, owners of the Alex Begg brand, is applying sustainability practices in its operations as part of its brand approach. This includes working to eliminate hazardous chemicals from all fabric production processes, ensuring aminal welfare in the animal fiber supply chain for wool and angora and developing traceability processes for sourced fibers. I understand that Moorbrook is also building a sustainability reporting capability and aligning its reporting processes with GRI Standards. So far, this work is internal and has not yet been published. Clearly behind the Lindéngruppen vision, however, Moorbrook has a positive sustainability story to tell and I look forward to hearing more. Lindéngruppen is an example of privately-owned, SME-scale, B2B businesses that are engaging with sustainability as essential supply chain partners for their customers and positive presences in their communities. It's inspiring to experience the passion that each company demonstrates in finding its own relevance and establishing its unique space along the sustainability spectrum. Led by a clear-headed, team-spirited and pragmatic Group Chief Sustainability Officer, Jenny Johansson, all companies in the group have the support they need to find their sustainability voice. And each is doing so at a pace that is manageable and enables maximum learning for each company along the journey. Lindéngruppen is proof that enlightened leadership and a practical approach is good for people, good for business and good for all of us, no matter the size or nature of the business. I wish all the Lindéngruppen team continued success and look forward to more Sustainability Reports of their progress. The Urban Dictionary says: "Geek: An outwardly normal person who has taken the time to learn technical skills. Geeks have as normal a social life as anyone, and usually the only way to tell if someone is a geek is if they inform you of their skills." Merriam Webster's third definition of geek is more straightforward: "an enthusiast or expert especially in a technological field or activity." In the CSR-Reporting Blog dictionary, reporting geeks are simply "folks who breathe, eat, sleep and live all things sustainability reporting." In the world of sustainability reporting, geeks have a place all of their own. Without geeks, reporting would never have achieved the major impact on the world it has had to date. Without geeks, we would still be begging companies for tidbits of information and clambering to understand whether they are performing in an ethical, responsible and sustainable manner. Without geeks, we would not have the opportunity to peruse the thousands of sustainability reports in all shapes, colors, sizes and languages that are published each year around the world, enriching our lives and making us feel that the world is a better place. Without geeks, sustainability reporting simply wouldn't happen - and then we would all be utterly miserable and the planet would be doomed. 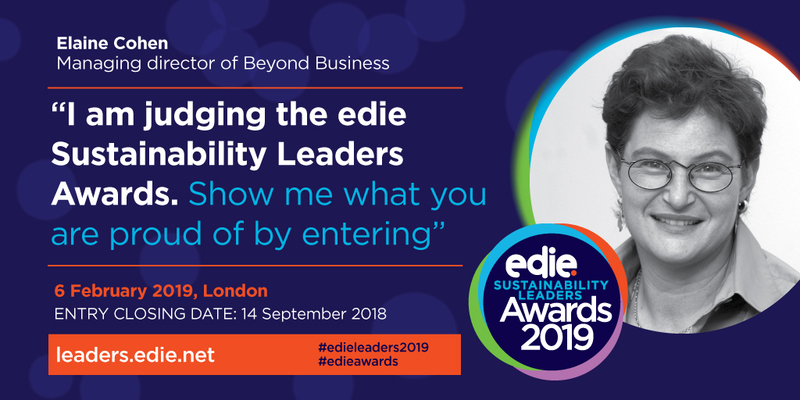 You attend the edie Smarter Sustainability Reporting Conference in London every year. The next conference, the seventh annual, in February 2018, designed by reporting geeks for reporting geeks and potential reporting geeks, boasts a stellar line up of speakers and an exciting program that any reporting geek will find invigorating, informative, incredible and impactful. An opportunity to debate with experts, explore with peers, learn with other professionals, moan and groan in a safe environment where everybody empathizes, ask questions that only the reporting community can relate to and share in the fun that is sustainability reporting, the edie Smarter Sustainability Reporting Conference will turn you into a reporting geek if you are not one already, or it will make you a geekier geek if you are already showing the signs. And who wouldn't want to put reporting geek on their resume? Can you afford to miss this unique opportunity? The CSR-Reporting Blog is offering a special discount for reporting and aspiring reporting geeks, so contact me if you want to take advantage of that. What can the geek community expect at the conference? As the Chair of the conference, I will be around all day to meet and reconnect with you all, make sure things go smoothly, add a little provocation to the panel discussions, and lead one of the breakout sessions with a deep-dive on reporting on environmental and supply chain impacts. Sound geeky enough for you? Of course, there are those of you out there that are secretly reporting geeks but afraid to admit it. It's time to come out. Reporting is mainstream. Reporting geekiness is something to be proud of. Proudly register for the edie Smarter Sustainability Reporting Conference here (don't forget to email me for your discount) and tell all your friends. They will thank you.